Sprinkle all the spices on the onions and toss them until the onions have a reddish color from the sumac. Top the taboon with a thin layer of the onion mixture. You may need to use more or less loaves depending on the size of the onions used. 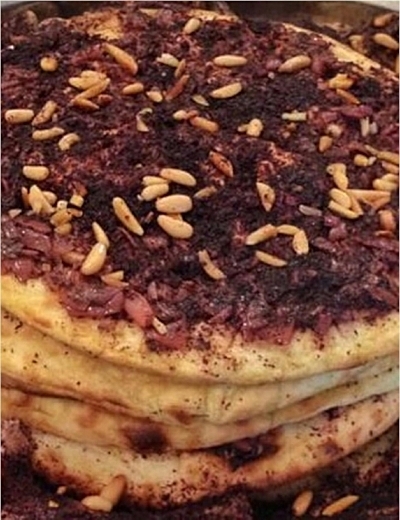 Top each with the zaatar and bake for 10-12 minutes until the dough is brown. 4 cans chick peas (or better yet, soak dry peas overnight, drain, cook in fresh water till tender) bring chick peas to a boil saving cooking or can water. Process chick peas while hot. Add remaining ingredients. Process 20 minute till smooth. This really takes time. Add hot cooking water until creamy and fluid enough to dip. Adjust lemon and salt. 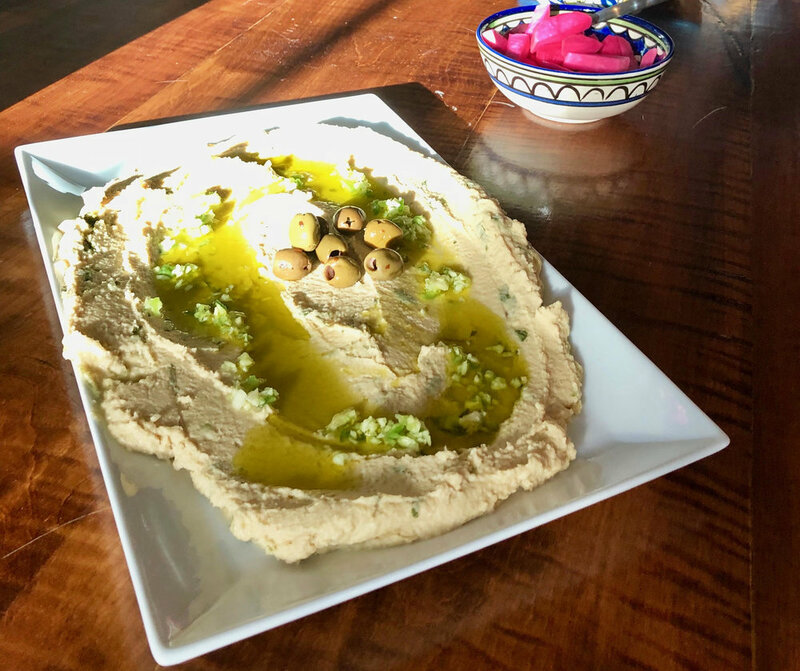 To serve, swirl cold hummus onto a platter leaving a round or oval well. Pour topping into well. Decorate with 5-7 whole chickpeas. Heat your oven to 425°. Cut off the tops of the eggplants and slice them long-ways into 6-8 pieces. Brush with Palestina olive oil and roast for about 40 minutes. When cool, remove the flesh from the skin and mash with a fork in a large bowl. While the eggplant is cooling, chop the tomatoes into small cubes, mince the parsley, and half the onion. (Use about 1/4 to 1/3 cup of the onion for the salad and reserve the remaining onion for another use.) add all these to the bowl with the mashed eggplant. Add two tablespoons of lemon juice, one tablespoon of pomegranate molasses and salt to taste. Mix thoroughly. This dish can be eaten warm or cool. Drizzle with olive oil and garnish with parsley sprigs and pomegranate seeds if available. Serve with toasted pita bread, or over salad greens.